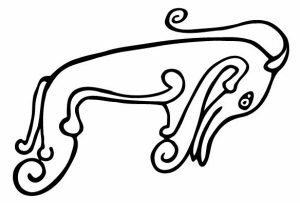 I’ve always been fascinated by the Pictish Beast. The Picts left behind very little of their culture, with the exception of the amazing carved stones you can find across Scotland, and while most of the animals on those stones are recognisably snakes, wolves, eagles, salmon, and so on, two-fifths of the creatures carved on the stones are images of the enigmatic ‘beast’. What was it? It must have been important, to be so common. Was it a dolphin, with its long nose? But dolphins don’t have horns or legs. A kelpie? We’ll probably never know. But it’s these mysteries and gaps in history that fire the imagination. When I visited Dundee recently, I took a trip to the McManus gallery. They had a Celtic exhibition on, including several Pictish stones – many of which contained a depiction of the beast. This one is the Strathmartine Castle Stone, so-called because it was built into the wall of Strathmartine Castle before being moved from its resting place. Strathmartine is an area of Angus to the north of Dundee. That was a name I recognised, and when I got back home to my books I dug up the reference. In Stuart McHardy’s excellent wee book On the Trail of Scotland’s Myths and Legends, he includes the story of Martin’s Stane. This isn’t the Strathmartine stone, but another, nearby Pictish stone, which is also known as the Balluderon Stone. That, too, has a Pictish beast on it, and it’s given rise to the legend of Martin the Dragonslayer. The story goes that there was a farmer at Pittempton near Dundee. (By the way, note that Pit- placenames go all the way back to the Picts – one of the few tiny fragments of their language to survive!) This farmer had nine daughters, and Martin was betrothed to marry the eldest. One day the farmer was feeling thirsty, so sent his eldest daughter off to the well to get him a drink. When she didn’t come back, he sent the second-eldest… Like most fathers in folklore, he was shockingly bad at recognising patterns, so one by one he sent his daughters off to the well. When none of them came back, the lazy father went off to the well himself – and saw a dragon coiled around the well, the bodies of his daughters ripped to pieces around it. I love how the folk etymology of Strathmartine incorporated elements of the Pictish stones, weaving them into the myth. 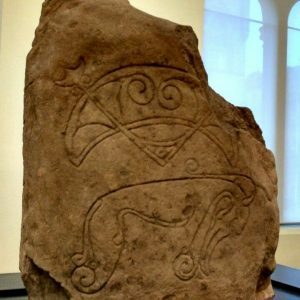 Truth be told, we know very little more today of the actual purpose of the Pictish stones, and what their amazing iconography means. Which makes me feel a little bit better about making up my own stories about the Picts, their stones, and the Pictish Beast. 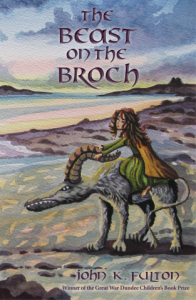 The Beast on the Broch is an historical fantasy adventure for children aged 8-12, featuring Picts, Scots, Vikings, a lonely girl, and her unforgettable friendship with the mythical Pictish Beast. Available to order now from your local bookshop, in selected branches of Waterstones throughout Scotland, or online from Amazon, Wordery, and so on. For more information, see My Books.